This was posted by the victim of this State of Arizona sponsored terror attack on 12 August 2016. 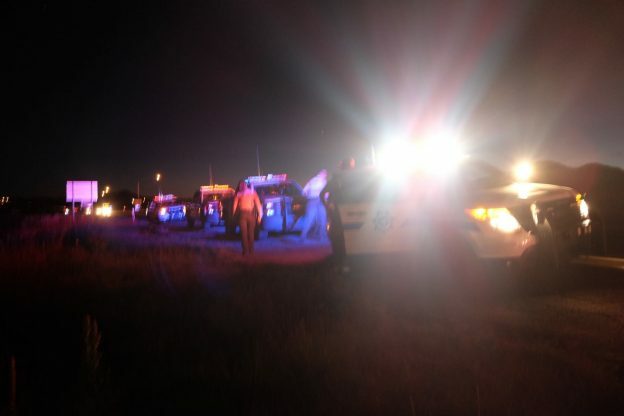 Tonight, I was arrested at gunpoint by an Arizona highway patrol officer who threatened to shoot me in the back (twice) in front of my 7-year-old daughter. For a moment, I was certain he was going to kill me for no reason. I’m alive, and I need to share the story. PLEASE SHARE IT, because I have an important reason for staying up past 1AM to write it down. My daughter and I are from San Francisco, on vacation, traveling through the Southwest. Today we were driving from Hoover Dam to the Grand Canyon in a Toyota Camry we’d rented from Fox Car Rental in Las Vegas. In Williams, Arizona, as I exited Interstate 40 to head north toward the Canyon rim, I was pulled over by an AHP officer who’d been tailing me for a couple of miles. I hadn’t been speeding, so I wondered if perhaps the car had a broken taillight or something. I rolled down my window and waited. Suddenly, the officer rapped on the rear passenger side window with his pistol. My daughter, who was sitting inches from the barrel of his gun, jumped with fear as the officer yelled at me to roll down the front passenger window, his service weapon pointed directly at me. I knew something was terribly awry and I tried to remain calm, keeping my hands visible as I slowly fumbled for the window controls in an unfamiliar car. My daughter rolled down her window and I explained that we were in a rental car, that we had no weapons, and I was having trouble figuring out how to roll down the front passenger window from my driver’s side door. The officer didn’t listen, and kept yelling louder and more insistently, ordering me to comply with his request as he leered at me down the barrel of his pistol. My daughter panicked and tried to get out of her booster seat to reach forward to roll down the front window, and the officer screamed her at her not to move as he pointed his pistol at her. Somehow I was able to get the window down, and then the officer ordered me to exit the car with my hands up. I did so slowly and with my hands raised as high in the air as possible, and as he came around to the driver’s side of the car he screamed at me to face away from him, as if I were doing something wrong. (I didn’t know this was the protocol for being arrested at gunpoint.) Then, as I had my hands in the air, he yelled, at the top of his lungs, in a voice I will never forget, as my daughter looked on in terror, “Get your hands away from your waist or I’ll blow two holes through your back right now!” My hands were high in the air as he said this, and I was not in any way reaching for my waist. I was utterly terrified. I’ve heard stories of police yelling out false things like this before they unjustifiably attack someone as a way to justify the attack, and I thought this was what was happening to me. I braced for bullets to hit me and all I could think of was my daughter having to watch it happen and being left alone on the side of the highway with an insane, violent cop. The bullets didn’t arrive, though. I followed every order of the officer as slowly and deliberately as I could, very slowly backed toward him, got to my knees, was placed in handcuffs, and was thrown inside the back of his car. By this time many more officers has arrived, and I could see a couple of them talking to my daughter. Why was I arrested? The car I was had rented had previously had its front license plate lost or stolen, so the car rental company reported this to the Nevada DMV. The Arizona highway patrol officer, who looked up my plate number while he was tailing me, misinterpreted this Nevada DMV report as meaning that I was driving a car with a stolen license plate, and somehow this prompted him to approach me at gunpoint and threaten to kill me in front of my little girl. After a few minutes he released me from the handcuffs, and since I knew the truth, I called him out for over-reacting, and told him he had no reason to threaten to shoot me. He stood by his story that I had made a threatening movement toward my waist, and I said it wasn’t true, and he said this wasn’t the place to discuss it. He let me go attend to my daughter but continued to “detain” us for another 20 minutes as he talked to his supervisors, presumably plotting damage control. I got his card, his supervisor’s number, the case number, and the cards of other officers on the scene. I’m not sure what I’m going to do about it. My daughter is traumatized. She said she wanted to cry to the officers who were comforting her, but she was afraid they would get mad at her. As we drove the final hour to our Grand Canyon hotel, she told me she was confused, because she thought the police were the good guys, and she didn’t know why the officer said he would kill me when my hands were in the air. I tried to come up with an explanation but I struggled for words. If you are a person who has ever looked skeptically at the claims of Black Lives Matter, or others who talk about police violence, I urge you to consider what happened to me and put yourselves in the shoes of others. I just survived a bizarre gunpoint situation in which I was as innocent as Philando Castile, who was not as lucky as I was. We live in a society where anywhere and everyone can have a gun at any time, and police are responding with fear in dangerous ways. I got lucky tonight. My daughter and I made it to the Grand Canyon and I’m going to try to salvage what’s left of our vacation. Many others – because of the color of their skin or the way they look or because of simple bad luck – did not meet the same fate. This entry was posted in corruption, news, police brutality and tagged arizona highway patrol, state sponsored terror on August 18, 2016 by demotropolis.